which hover over the mud of attachment and desire. and the lotus flowers bloomed where he stepped. Lotus is a symbol of rebirth and purity. It grows from thick rhizomes submerged in silt and mud, and the leaves float on the water surface or above it. Flowers grow a few centimeters above the leaves. The plant reaches a height of 150 cm, and sometimes even 5 meters. The leaves are up to 60 cm in diameter, and the flowers of 20 cm. Lotus leaves are water repellent: drops of water roll after them collecting from the surface insects and dust. 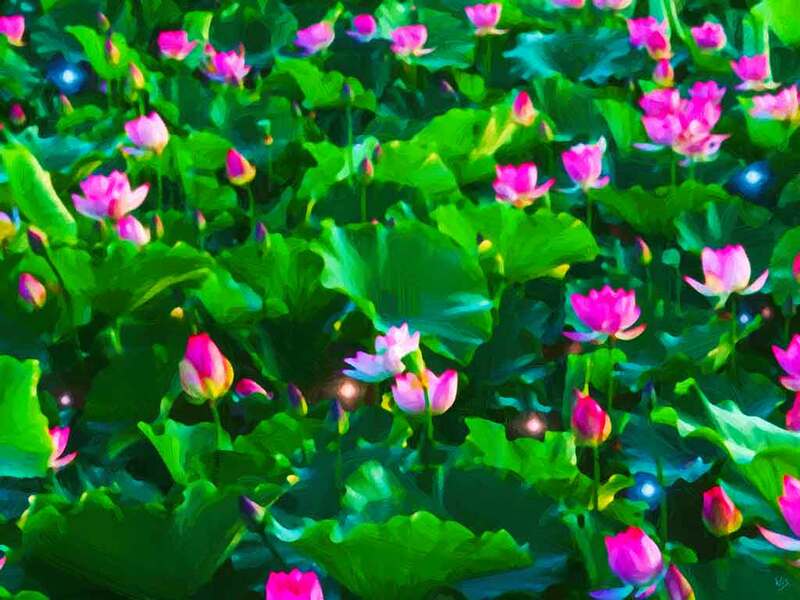 Lotus has the remarkable ability to control the temperature, as it happens in humans and warm-blooded animals. Flowers heat to over 30 ° C, even when the air temperature falls to 10 ° C. The heat releases a scent attracting insects. They pollinate plants and feed on nectar and pollen that strengthen their ability to eat, flight and pairing up. I love to paint lotus flowers. I trust that paintings will never fade.